This strange toy grabbed my attention as I was grabbing my lunch in Sainsbury's. Plasma Kreaps. 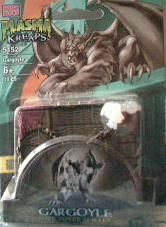 Now obviously the cool mispelling of 'creaps' immediately made me want this toy. 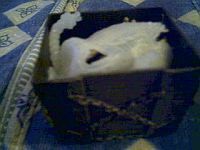 Then seeing what appeared to be a pirate's treasure chest, well who could ask for more? But there is more. 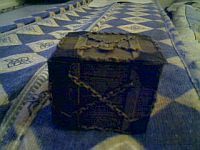 Once you open the treasure chest there is a monster inside. 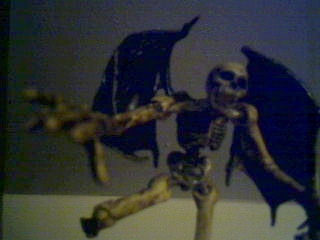 The ones I picked up had a 'ghoul' and a 'gargoyle' in them. 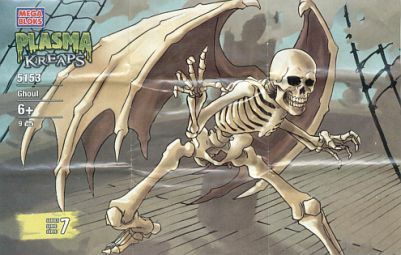 In the 'Plasmaverse' a ghoul means a skeleton with wings. This strange toy is officially awesome. There is a range of monsters you can collect (but of course). A ghoul, a gargoyle, a vampire, a werewolf, a mummy and a zombie. They each come with a little mini poster as well. Now the thing that confuses me is, sure fine make a range of monsters. Kids like monsters. But why are they in pirate treasure chests? Are they supposed to be cursed treasure? Maybe it is to discourage kids from becoming pirates when they grow up. "Now Johnny I know you want to be a pirate when you are older but it isn't all swashbuckling and drinking rum. Sometimes you have to dig up treasure. Sometimes you'll get treasure, but other times you'll open the treasure chest to find a monster who will eat you." 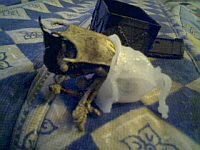 Admittedly if they were like these toys little Johnny would first have to open the chest, pull the bits of a monster out of a ambiotic sack and then construct the monster, but a monster none the less. Now it could just be me reading too much into the design of the chests to think of pirates but if you look on the packaging the ghoul says it is a 'Shipwreck Ocean Stalker'. Plus the poster clearly shows it on deck. Even if the deck appears to be above water. Just what kind of lame shipwrecks does this thing stalk anyway? Maybe the heavy wings weigh it down and it is unable to swim. Beware anyone who goes to loot or explore a shipwreck on dry land! Not a very fearsome legend really. Although it explains why deep sea divers aren't too bothered hunting round old shipwrecks on the bottom of the sea. The gargoyle says on it that it is a 'Dark Tower Stalker'. That at least makes a bit of sense. Why would a gargoyle be on a pirate ship? But why would a pirate's treasure chest be in a dark tower? Aaah these toys make my brain hurt. The last thing to mention is that on the instructions they show that the different toys have interchangeable parts. However the example they show is the Plasma Kreaps' Ghoul mixed up with something known as Plasma Tech - Bogkov. It seems I may have found the saner end of the Plasmaverse! Apparently they also have Plasma Dragons and Plasma Dinosaurs. I'm waiting for Plasma Wrestlers and Plasma Sharks. It's bound to happen. Overall these toys are quite good. They are well made with unusual packaging and the ability to mix and match between them allows you to come up with your own variations. The joins at the arms, legs and head make them very poseable. 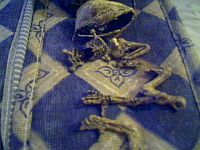 The ghoul's skull even had a jaw bone you could open or close. I'm just not quite sure what the point of them is. They each have a little map showing where in the World they come from and they all seem to come from different parts. So they are unlikely to meet. Plus where are the pirates who find them (or box them up presumabley). As with many strange toys it is probably best not to think about it. I just feel glad there is something spooky and different lurking on the toy shelves inbetween the wrestling figures and fifteen different types of Batman. Click Here to see the instructions and a glimpse of the other 'Kreaps'.